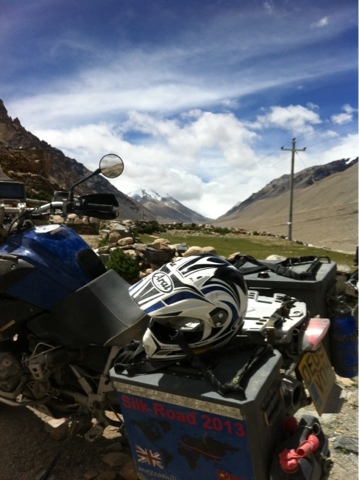 The road to Mt Everest from Dingri (the nearest town) is 105km. Apart from the first ten. The road is an unrelenting series of hairpins carved out of the scree. On the plus side, there is no sand. Instead there are jagged rocks and corrugations. Corrugated roads are an interesting phenomenon. Caused by heavy trucks, the vibration frequency of their suspension turns the road into a regular series of ridges, rather like a piece of over sized corrugated iron. They are terrible to ride on. The regular vibration shakes everything loose, bits of the bike as well as bits of you. The rough conditions played havoc with suspensions. The rear shocks on three of the eleven bikes that made the trip failed with oil leaking out and clouds of smoke. Snowy also suffered with one of the front suspension cools breaking under the punishment. It was a tough day. Breakages, one minor spill and a gruelling ride there with the certain knowledge that you had to ride back the same way. We are all exhausted. So why did we go? To see Mount Everest of course. The weather was not kind and covered the summit for much of the dsy,. when it broke the iconic peak rose above our heads and made the whole journey worth while.